The night wasn’t so dark nor the horizon so stark when I returned and almost ran into a large moon hovering low behind the oak tree guarding the driveway down the street. I forgot how large the moon could appear. Tired after a long day, I yielded to all the crescents in my past, letting them break from their mooring to be suffused with this silvery light. Hackneyed though it may sound, it has got to be called silvery, you would agree too if you saw it. It did appear to be very close, close enough not to be jarred by the thought that for a brief time we were one. For it is theorized that a Mars-size planet collided with our earth when it was young with both planets’ mantles comprised of silica and their cores iron. 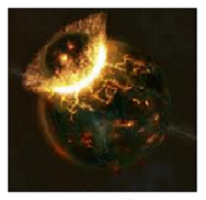 The force of the collision was so great that the errant planet almost destroyed the earth, piercing through earth’s core, leaving almost all of its iron  . The earth endured and the moon emerged, sans iron, from the collision not unlike the phoenix rising from its ashes. 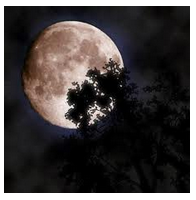 Did you know that the moon is younger than its previously estimated age of 4,56 billion years? Just last August, an international team of US, French and Danish scientists announced a new technique of measuring the isotopes of lead and neodymium in a piece of rock brought back from the Apollo 16 mission to show that our moon is only 4.36 billion years old, the same age as the zircon found in Australia . The mind’s comprehension of such large number adds a kind of permanence to the silvery light and I am glad. Gladness is not the prevalent emotion I’ve found in moon-inspired poems. For beside exerting gravitational force on our waters to cause tides, the moon is also a force that leaves her marks in many poems. I could not choose just one so I’ll settle with couplets and stanzas of several much-admired poems that came my way and stayed – the one from Dylan Thomas has been with me for quite some time, Alicia Stallings’s makes formal meters appear illicitly daring. 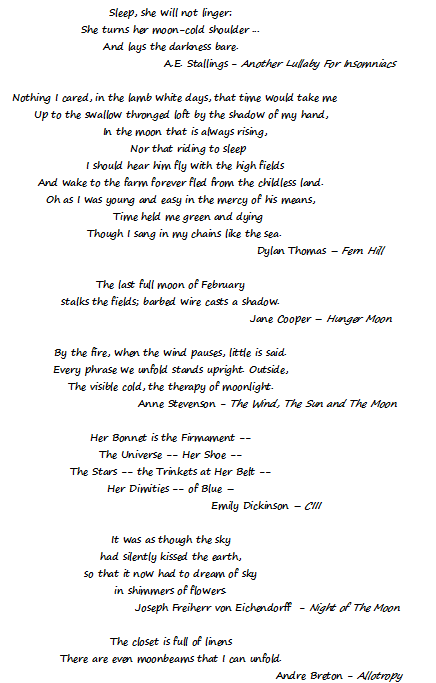 I can’t resist the juxtaposition of the stalking and therapeutic presence of the moon in the other excerpts, the rhythm of Emily Dickinson’s, nor let this post be unadorned by the prettiness of Joseph Eichendorff’s simile describing the shimmering light. And I wonder how it feels to unfold moonbeams. 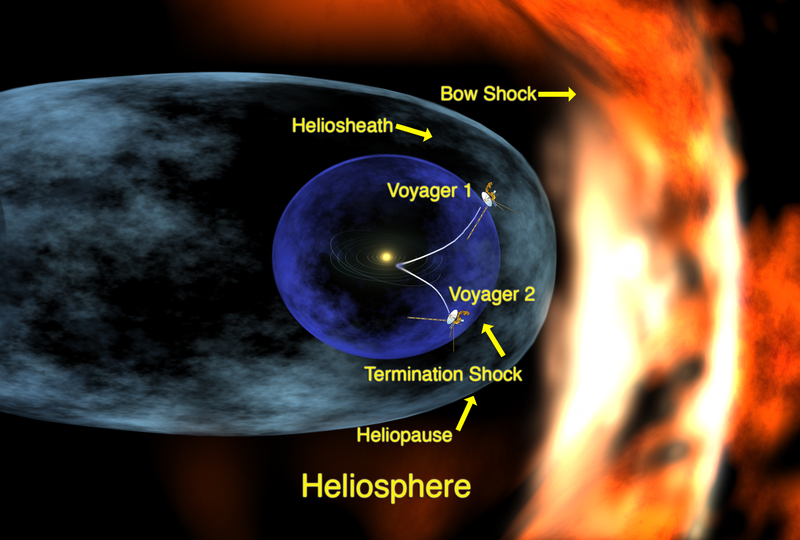 The poetic pleasure indulged thus far is complemented by the fact that the moon has no atmosphere, but only a thin exosphere – a cubic centimeter of Earth’s atmosphere at sea level contains about 100 billion billion molecules whereas that same volume of the Moon’s exosphere contains only about 100 molecules . Not only that, during the lunar night, this exosphere falls to the ground, sleeping perhaps. Because of this lack of atmosphere, footsteps left on the moon will last millions of years. 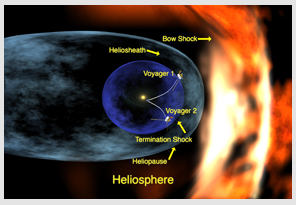 Forever can’t be measured but relative permanence is possible, as long as the heliosphere endures to save us from the unrelenting intergalactic radiation. Thank you for helping me choose, dear muse. With apologies to the poet A.E. Stalling for the fragmented quote of her poem.